September 22, 2011 – In an impressive display of power and technology, Pratt & Whitney Rocketdyne successfully completed a series of hot-fire tests on the certified RS-68A engine, the world's most powerful hydrogen-fueled engine. The tests demonstrated the capability of the engine to operate for 4,800 seconds of cumulative run time – four times the design life of the engine and more than 10 times what’s needed to boost a United Launch Alliance heavy-lift rocket into space. The tests took place at John C. Stennis Space Center in Mississippi. The Pratt & Whitney Rocketdyne RS-68 (Rocket System 68) is a liquid-fuel rocket engine that burns liquid hydrogen (LH2) with liquid oxygen (LOX). It is the largest hydrogen-fueled engine in the world. Development of the engine started in the 1990s with the goal of producing a simpler, less-costly, heavy-lift engine for the Delta IV launch system. The engine has three versions: the original RS-68, the improved RS-68A, and the RS-68B for NASA. The RS-68 was developed at Rocketdyne Propulsion and Power, located in Canoga Park, Los Angeles, California, to power the Delta IV Evolved Expendable Launch Vehicle (EELV). The combustion chamber burns liquid hydrogen and liquid oxygen at 1,486 lbf/in² (10.25 MPa) at 102% with a 1:6 engine mixture ratio. At a maximum 102% thrust, the engine produces 758,000 pounds-force (3,370 kN) in a vacuum and 663,000 pounds-force (2,950 kN) at sea level. The engine's mass is 14,560 pounds (6,600 kg) at 96 inches (2.4 m). With this thrust, the engine has a thrust-to-weight ratio of 51.2, and a specific impulse of 410 s (4 kNs/kg) in a vacuum and 365 s (3.58 kNs/kg) at sea level. The RS-68 is gimbaled hydraulically and is capable of throttling between 58% and 101% thrust. A leading goal of the RS-68 program was to produce a simple engine that would be cost-effective when jettisoned after a single launch. 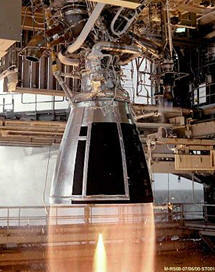 To achieve this, the RS-68 has 80% fewer parts than the multi-launch Space Shuttle main engine (SSME). Simplicity came at the cost of lower thrust-efficiency versus the SSME: the RS-68's thrust-to-weight ratio is significantly lower and the RS-68's specific impulse is 10% lower. The benefit of the RS-68 is its reduced construction cost: To build an RS-68 for the Boeing Delta IV program costs about $14 million, compared to $50 million for the SSME. While the SSME's higher costs were designed to be spread across multiple launches, the larger, less-costly, more powerful (50% more thrust) RS-68 was a more cost-effective engine for an expendable launch vehicle. The RS-68A is a liquid-hydrogen/liquid-oxygen booster engine designed to provide increased thrust and improved fuel efficiency for the Delta IV family of launch vehicles. It evolved from the RS-68 engine, which was developed and certified for commercial use entirely on private company funds. Each RS-68A will provide 702,000 pounds of lift-off thrust, or 39,000 more pounds of thrust than the RS-68 engine, with increased combustion efficiency as well. In addition to the successful margin demonstration testing of the RS-68A engine, Pratt & Whitney Rocketdyne, together with NASA, has begun testing on the upper-stage J-2X engine. To date, five hot-fire tests have been conducted on the J-2X, which could be used to boost humans beyond low-Earth orbit.